Another common question that generally comes up is how do we change the sort order in Dashboard prompts. Generally, sort order is determined by the sorting column which you have specified in the repository. If you do not have any alternative sorting column specified in the repository then the default alphabetic sort is done on non-numeral columns and numeric sort is done on numeric columns. 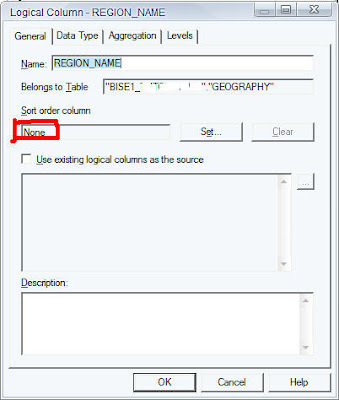 If you are not sure what i mean, lets create a simple dashboard prompt on the column REGION_NAME which does not have any sort order specified in the Business Model Layer. As you see above, the dashboard prompt by default sorts it alphabetically. Now, how do we make it to sort in the descending order. In order to do this, go to the dashboard prompt. Convert the Show Results from “All Values” to “SQL Results”. Then enter the following SQL. This will automatically sort the results in the descending order. This will again automatically sort the results based on another column of the same granularity. The above can be useful in quite a few situations when you dont have a sort order specified in the repository. This entry was posted on February 14, 2008 at 11:46 am	and is filed under All Posts, OBI EE Plus. You can follow any responses to this entry through the RSS 2.0 feed. You can leave a response, or trackback from your own site. Thanks for the article. I am in need of changing sort order dynamically. That is, I have set a few columns as the default sorting columns when the report loads. But when the user searches by entering a value in a particular prompt (which was empty when the report loaded), I want to use different columns for sorting. IS this possible?